LAWRENCE — Along with global climate change, loss of habitat poses a prime threat to the well-being of Earth’s animals. As people farm and develop more land that once teemed with a range of species, biodiversity and animal populations suffer. Now, a new push by the Western Governors’ Association aims to map crucial habitat in the Western United States. The project is dubbed CHAT, an acronym for Crucial Habitat Assessment Tool. The project’s development depended in large part upon technology honed by the Kansas Applied Remote Sensing program, a division of the Kansas Biological Survey. The web-based tool was launched in December at the WGA’s winter meeting. The KU researcher said that the CHAT is a nonregulatory tool meant to inform and aid in decision making. If a proposed project could affect important wildlife habitat, information derived from the CHAT could help find alternative siting options to avoid or minimize those effects. In 2001, the Kansas Applied Remote Sensing (KARS) program began a partnership with the Kansas Department of Wildlife, Parks and Tourism (KDWPT) to provide GIS mapping and analysis support. This partnership led to the KARS program having a central role in the CHAT project that began in 2011 when KDWPT and the other state wildlife agencies began developing the framework and interstate cooperative relationships. To create the assessment tool, KARS used cutting-edge software to provide geographic information system analysis, data processing and Internet data-sharing functions. While Houts coordinated with KDWPT to incorporate state priorities and objectives into the data analysis and processing, Jorgina Ross at KARS implemented secure online mapping services during project development. Jennifer Delisle and Bill Busby from the Kansas Natural Heritage Inventory program — also a part of the Kansas Biological Survey — provided valuable data and expert opinions used in the creation of the “Kansas Species of Concern” dataset. Indeed, each state involved in the process had its own goals. Houts said the general public, policy makers, planners, developers and conservation groups could use the WGA CHAT to examine which areas are most vital to wildlife and which areas are less sensitive to development. 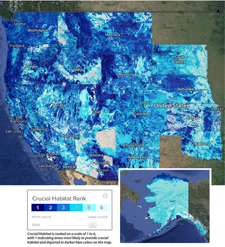 “It could be to identify a preliminary path of lowest impact for large or multistate projects, identify areas for increased connectivity between crucial areas, or more specific applications based on more focused data themes like Species of Concern or Large Natural Landscapes," he said. “Once a general region is identified in the WGA CHAT, users can access a state-specific CHAT layer like the Kansas Natural Resource Planner to get more specific information and then finally contact state officials for a final project review." Houts hoped the new tool could be a boon to wildlife and responsible development in the Western United States. The WGA CHAT is available online.